As it stands now, the proposed meaningful use rule requires healthcare entities to provide most patients with an electronic version of their records within two days of asking. Is that feasible? Forty-eight hours. That’s the turnaround time hospitals and eligible providers hoping to satisfy meaningful use criteria must meet when patients request an electronic copy of their health information—that is, if the Centers for Medicare & Medicaid Services (CMS) finalizes its proposed rule published in the Federal Register on January 13. Comments on the rule were due March 15 and, for now, it’s a stay-tuned environment. Experts say although the industry is waiting for final guidance, there’s no time like the present to understand the proposed meaningful use requirements and how they may affect release-of-information (ROI) workflow. The 48-hour turnaround time hospitals must meet for at least 80% of all patients who request an electronic copy of their information is particularly challenging, says Stephen Hynes, president and chief operating officer for MRO Corp, a company specializing in ROI, audit tracking, and document management applications. Onerous is an accurate way to describe the 48-hour turnaround time, especially for hospitals with hybrid records, says Jan McDavid, general counsel and compliance officer for HealthPort. When patients present to the emergency department (ED) and are subsequently admitted to the hospital, ROI specialists must look in myriad systems to track down ED records, inpatient records, prescription records, and more, making a 48-hour deadline nearly impossible, she adds. 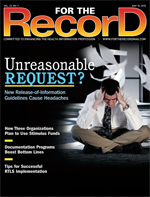 Perhaps the biggest stumbling block is the fact that there is a large discrepancy between the proposed 48-hour turnaround time and HIPAA (which allows covered entities 30 days to complete a request for copies of records) and the CMS (which allows physicians 30 days to complete and sign off on their charts), says Rose T. Dunn, MBA, RHIA, CPA, FACHE, chief operating officer of First Class Solutions, Inc. Even after hospitals implement EHRs with e-signature capability, medical staff bylaws typically reflect the 30-day time frame, leaving plenty of wiggle room for compliance, says Kelly McLendon, RHIA, president of Health Information Xperts. “The bottom line is that [physicians] don’t sign [charts] right away,” he says. To complicate matters, most incomplete chart-tracking systems allow physicians at least two weeks to complete records. They also oftentimes provide a warning before the incomplete record becomes a deficiency, he adds. Next comes the question of exactly what hospitals must produce within the 48 hours. As part of the proposed meaningful use criteria, hospitals and eligible providers must provide diagnostic test results, problem lists, medication lists, discharge summaries, and procedures. However, it’s unclear whether this is an all-inclusive list or whether patients could request an electronic copy of their entire record, says McDavid, adding that although there hasn’t been a huge surge in patient requests for records over time, some individuals do ask for the information when moving to a new location or switching doctors. Aside from its operational headaches, the 48-hour time frame is also somewhat ambiguous. There’s no definitive guidance regarding what triggers the 48 hours, says Dunn. “The verbiage should say ‘48 hours from the time it is available in the EHR,’” she says. It’s also unclear whether the requirement applies only to business days or every day of the week, she adds. Likewise, it’s vague as to when the clock stops ticking, says Hynes. For example, must the patient actually receive the information within 48 hours, or must the hospital or eligible provider simply send the information within this time frame? For hospitals or eligible providers requiring prepayment for ROI requests, 48 hours seems unreasonable, says Hynes, adding that even without waiting for prepayment, average turnaround time for ROI is typically three to four days. Another question is how the 48-hour turnaround time applies to hybrid records, says Hynes. When a patient requests a copy of his or her entire record, must ROI staff members fulfill the request for both the paper and electronic information within 48 hours? From a technical standpoint, many EHR vendors simply don’t have the ability to create electronic copies of information that can be given to patients or other requesters, says McLendon. “A lot of these systems don’t allow you to burn information to CDs or move copies to flash drives. A lot of them don’t even allow attachments to be put into e-mails,” he says. The good news is that all of this may soon change. The ability to produce health information in an electronic format is a requirement according to certification criteria for certified EHRs. The Office of the National Coordinator for HIT (ONC) released this criteria in a proposed rule published in the Federal Register on March 10. As of February 17, the American Recovery and Reinvestment Act (ARRA) forces hospitals and eligible providers to take the first step into an electronic environment by requiring covered entities that use or maintain an EHR to provide electronic copies of health information to patients. Meaningful use criteria that impose specific timelines on producing that electronic information will be the next step. Many providers are currently struggling with ARRA requirements to simply produce electronic copies on demand, says McDavid. Adding a 48-hour turnaround time requirement for meaningful use on top of that adds a layer of complexity, she says. Although the proposed meaningful use criteria related to ROI seem to be good in theory, they don’t address the issue of logistics, says Dunn. There is a misconception among policy makers that releasing information electronically is as simple as pushing a button, she adds. There’s also no one-size-fits-all methodology that can be applied to all requests, says Hynes. “Some requests are more difficult to fulfill than others. Some get turned around in a day. Others are more onerous because the record might be very large or in multiple formats in the hospital, and it might take four to five days to pull together,” he says. Another ambiguity is the specific electronic format in which copies must be provided. Likely options—though the meaningful use or certification criteria don’t state them specifically—seem to include DVDs, CDs, e-mails, and patient portals, says McLendon. “Certification is not going to prescribe a single method for providing electronic copies. There are going to be multiple ways to do it. That means that vendors are going to do it multiple ways, which means HIM is going to have to figure out which system does what and how, and they’re going to have to adapt their ROI structure to it,” he says. Aside from the 48-hour turnaround time, there are other proposed meaningful use criteria that may also affect ROI workflow. For example, discharge instructions must be provided in an electronic format upon a patient’s request. The meaningful use proposed rule specifies that at least 80% of all patients who are discharged from an eligible hospital and who request an electronic copy of their discharge instructions and procedures are provided it at the time of discharge. “There’s been a lot of push in ARRA to give information to patients electronically. I’m curious to know who’s driving the agenda here because we haven’t seen a broad-base push from patients,” says Hynes. McDavid echoes this sentiment, adding that patients typically account for fewer than 10% of all requesters. In addition to the requirements outlined above, eligible providers must also provide patients with timely electronic access to health information (ie, within 96 hours of the information being available to the eligible provider). The proposed rule states eligible providers must be able to demonstrate that at least 10% of all unique patients seen by the eligible provider are provided this access. The rule defines a unique patient as one who is counted only once, regardless of whether he or she is seen multiple times. Eligible providers must also demonstrate that clinical summaries are provided to patients for at least 80% of all office visits. The clinical summary—which includes an updated medication list, laboratory and other diagnostic test orders, procedures, and other instructions based on clinical discussions that took place during the office visit—may be provided on paper even though the rule states it can also be provided through a personal health record, patient portal on the Web site, secure e-mail, or electronic media (eg, CD or USB). • Patient authorization: ROI specialists will need to verify the specific format in which the patient requests the information. “Electronic” should be added as an option on authorization forms, says McLendon. If the patient requests paper copies, the release is not subject to the 48-hour turnaround time. • Prioritization: Because the 48-hour turnaround time pertains only to patient requests for electronic copies of health information, ROI specialists will need to give these requests a higher priority in order to meet meaningful use criteria, says McLendon, adding that many hospitals and eligible providers already prioritize patient requests to maintain high standards of customer service, but it may become a necessity if the proposed criteria are finalized. Those who use a “first-in, first-out” method to process ROI requests will need to consider segregating patient requests and processing them first, says Hynes. The only downside, he notes, is that other important requests, such as those from attorneys or those for disability claims, will be delayed. “For everything that you expedite, you’re delaying another request,” says Hynes. • Encryption: According to HITECH, electronic transmissions of protected health information must be encrypted. Although hospitals and eligible providers may be tempted to take the easy way out by simply saving PDFs to a CD, this may not be the best option, especially if the CDs are not encrypted, explains McDavid, who says HealthPort stores data via a secure Web site and provides customers with a key/password to access the encrypted data. “In my opinion, the answer is secure e-mail,” says McLendon. “If the patient wants an electronic copy, they sign up for the secure e-mail, and then the hospital e-mails it to them. Then it’s already encrypted when you send it.” Signing patients up for secure e-mail will be an added step in the workflow process, he adds. Patients may also need education about encryption and how to access the secure information using a key or other mechanism, notes Dunn, adding that the ROI specialist may be responsible for this task. • Back-end processes: Although front-end processes (eg, accepting the release, verifying authorization) won’t change significantly, the way in which information is saved and delivered will be different, says McLendon. “You still have a lot of work to do. You’re not photocopying, but you have to get a copy of it burned or put into a file. You still have to review every page that’s going out,” he says. When patients request electronic copies of discharge instructions, nurses and case managers will need to know how to access the information and save it electronically, which is different from the paper-based methods to which they have become accustomed, says McDavid. — Lisa A. Eramo is a freelance writer and editor in Cranston, R.I., who specializes in healthcare regulatory topics, health information management, and medical coding.